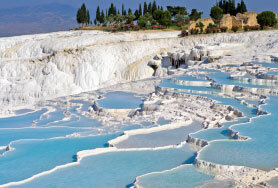 Nestled between Europe and Asia is the beautiful country of Turkey; a treasure chest filled with stunning landscapes, a diverse climate, and a rich cultural heritage and welcoming people. Most cities in Turkey have several ancient monuments and ruins, which portray the strong history and traces of religious diversity in this country. Travelling to Turkey is an experience which will always leave you wanting more. Our guests always leave saying – We will be back!!! If you are a history enthusiast, travelling to Turkey should definitely be an item on your bucket list. Irrespective of the era in history that entices you; there is a touch of every period waiting to be explored. Ancient Lydian History, even Neo-lithic sites as wells as Greco-Roman ancient sites, and places of Christian Pilgramage, If you are keen to find traces of more recent events, you will can visit Gallipoli, whose 100th anniversary is celebrated thiss April. Learn about the impact of this and the War of Independance on the Turkish Nations. You can travel around the country for a long time and still be unable to see all of it. Any time is a great time to visit Turkey. In Istanbul the wonders of Byzantium and Ottoman ear are stunning in both the winter and the summer months. The country is surrounded by high mountains and open seas which allows it to have a diverse climatic conditions. One can enjoy all of the four seasons in Turkey. Spring in Turkey usually lasts through March, April and May. The season experiences long days with moderate temperatures throughout the country. It is a good time to travel to the country as you can witness the the rich flora and fauna the country has to offer. In Istanbul the Tulip Festival takes Place in April, many music festivals take place in June – there is always something to enjoy. Ramadam in 2017 takes place between 24 Mau to 22 June – but this a time for celebration particular at Iftar or breakfast time, when all families enjoy the evening air, and break fast together at various points in the Old City. It is a time of fasting, reflection and being together as a family! If you prefer the Mediterranean climate, then visiting the southern part of Turkey will make your visit worthwhile as the hot and dry summers will help you get the perfect tan. June, July and August make up the period for summer and the coast areas can be quite crowed. But it is a great time to enjoy the Sapphire Coast, or a gulet trip, or a small seaside village for a week off during your travels. 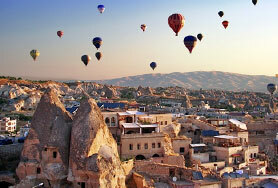 , Cappadocia is great place to visit at this time of year, and evenings are quite cooler than in the South. A Balloon Flight in the summer months is magical. The second most popular season for travelling around Turkey would have to be autumn due to is comfortable temperatures. The months of September to November usually has shorter days with some rainfall. However, it is definitely a good time to visit and experience the historical sites and enjoy the local life. We can assist with hotel reservations, and know the best locations and prices. 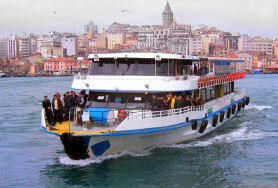 At the moment prices in Istanbul are very competitive.! The northern region of Turkey experiences an oceanic climate with warm summers and cool winters. The winter months are from December to February offers a wide range of sporting activities such as skiing and snowboarding. There are comparatively smaller number of tourists visiting but the lower prices and less crowds can be it an attractive time to visit. With its famous monuments, such as Hagia Sophia and Blue Mosque and its Bazaar quarter – Istanbul is an amazing city with a blend of cultures from centuries past. Its energy is tangible – a visit to the areas surrounding the Spice are just music to the senses! Visit Galatala and Beyoglu area for a different feel – funky shops, great areas to eat in, alleyways full of food, modern museums and shops with great clothes. On a Sunday Istiklel Caddesi heaves with energy ! Why not take one of our back street walks. 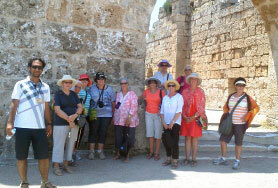 We have a selection of 6 different walking tours, so get off the beaten track, see the real Istanbul on a hosted walk! 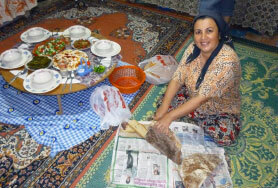 Experience the real Turkey and stay in a Turkish Village ! Meet local people, spend a day or two in the fields, and eat delicious home made food. made with love by Serhar our village hostess. ! Something different that you will remember always. Our guests tell us that this is the highlight of their trip! SOME FACTS, FIGURES AND TIPS !! Turkey is a country of many contrasts: urban and rural, secular and Islamic, European and Asian, with mountains and coastal beaches. Below are some of the major statistics and interesting facts about contemporary Turkey. Most of Turkey’s land mass lies in Asia. A portion of Istanbul, the largest city, lies in Europe on the western side, as does the sliver of land in the northwest of the country. Istanbul is an awesome world metropolis of approximately 17 million residents which straddles two continents and embodies the many dualities of modern Turkey. The capital of Turkey is Ankara, and its largest city is Istanbul, which was called Constantinople during the Byantium and Ottoman Eras. Turkey borders the European countries of Greece and Bulgaria in the West , shares borders with Syria, Iraq and Iran in the East and Armenia and Georgia to the Northeast. The majority of Turks are Muslim but Turkey has a secular constitution and government. There are populations of Christians and Jews as well as historic churches and many important biblical sites and artifacts. Turkey has more Greek and Roman ruins than either Greece or Italy. 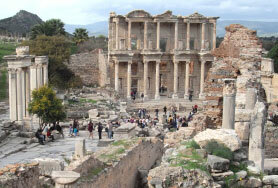 In fact, Turkey has more Greek and Roman ruins than Italy and Greece combined. Major ancient cities include Troy, Ephesus, Sparta, Aspendos, Aphrodisias and Pergamum as well as many other sites scattered throughout the country.Mount Ararat, the legendary landing place of Noah’s Ark, is in the far eastern portion of the country, in the city of Agri. 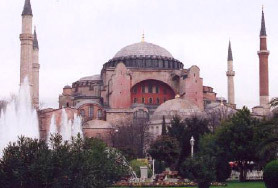 Turkey has a greater number of important Christian and Jewish sites than Israel including the site of the first Christian Church, the house of the Virgin Mary, the birthplace of the prophet Abraham, the staff of Moses, and much more. It has hundreds of beaches and Marinas on the Mediterranean and Aegean Seas. Turkey has a temperate climate with hot, dry summers and generally mild, wet winters; temperatures can be harsher in interior. September-November and March-May are considered the best times for ‘perfect’ weather. May-September is the best time to enjoy hot ‘beach’ weather. Winters can be cold but offer fewer visitors and attractive discounts. The oldest known human settlement is in Catalhoyuk, near Konya. The battle of Gallipoli is considered a defining moment not only for Australians and New Zealanders but in the history of the Turkish people. The struggle laid the grounds for the Turkish War of Independence and the foundation of the Republic of Turkey eight years later under Atatürk, himself the commander of the 57th Regiment at Gallipoli. The Çanakkale Battles are commemorated every year in Çanakkale on 18 March and ANZAC day is celebrated 24–25 April with a wide participation from Australia and New Zealand and Turkish people. 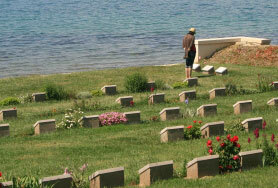 Gallipoli is approx. 5 hours drive from Istanbul and it is possible to visit in one day. When entering Turkey some countries are required to purchase a visa, which is valid for 90 days. The cost for Australian and Canadian Residents is Euro 45 US$ 60 per person. For US citizens and most other countries it is Euro 45 or US60 and British citizens GBP20. This must now be purchased online through the link –www.evisa.gov.tr If you don’t you can still buy it on arrival but they will be a higher price and the queue will be long. Print off your visa and put it in your passport and then you can go straight to passport kontrol. Part of your tour will be an arrival transfer. The transfer man will be waiting for you at the barrier in arrivals hall. He will have a name sign with your name l underneath it. He will take you outside to the waiting van and then you will come directly to the hotel. Sometimes the airport is very crowded so if you can’t find him go to the Information Booth on the left hand side of the barrier and wait there as the transfer attendant will ring us to find you. DO NOT GO OUTSIDE THE TERMINAL DOOR AS THEY WILL NEVER FIND YOU! We can also provide a meet and greet service at small extra cost – so you will be feel even more welcome after your long flight! Turkey is an Islamic country and modesty and politeness are much admired. Having said that, Turkish people are very tolerant and welcoming to tourists. Common sense in your dressing is advised. When you are entering mosques women need to cover their heads and legs, and shorts for men are not acceptable in Mosques. Always have a scarf handy for those times when you want to enter a mosque, and they do have scarves and pull on skirts for tourists. In the summer short sleeved shirts and shorts are acceptable but it is best not to wear brief shorts and tops out of respect. Westerners are very welcome to visit Mosques which are free of charge. Turkish people are very friendly and often stop to help visitors with directions, Everyday you hear people say to tourists – are you lost??? Often they will offer a cay (tea) and just have a chat. Temperatures can vary from -2 degrees with snow in Istanbul in the winter time to hot and high forties in the southern and eastern parts of the country.